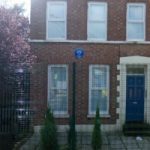 McNeice was born in Belfast in 1907, the son of a Church of Ireland clergyman who later became a bishop. Educated in England (Marlborough and Oxford), he lectured in Classics in Birmingham and London; his verse translation of the Agamemnon of Aeschylus is of high literary quality. In 1941 he joined the BBC Features Department and was responsible for many classic productions, including his own radio play The Dark Tower (with music by Benjamin Britten). He was for a short period in the 1950’s Director of the British Institute in Athens. 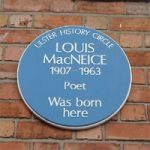 Along with Auden, Spender and Day Lewis, MacNeice formed the leading group of poets of the 1930’s. His work is colloquial and ironic, but intellectually distinguished and informed by a real tragic sense. He casts an ironic eye on the politics of Ireland (“I was born in Belfast to the banging of Orange drums”) but his love for the country always shines through. His most considerable work is Autumn Journal (1939), a meditation on Munich and the approach of war; but he is also the author of many notable short poems (e.g. The Sunlight In the Garden, Bagpipe Music). 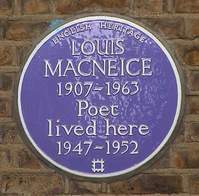 MacNeice died in 1963 from viral pneumonia, reputedly caught while he was exploring a cave for a projected radio programme. He is buried at the C. of I. church, Carrowdore, Co Down. The poet is also associated with St Nicholas’s Church, Carrickfergus, where his father was rector. 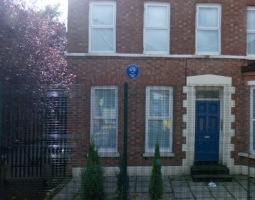 Location of plaque: On the birth house, at 2 Brookhill Avenue (off Cliftonville Road, to the side of Belfast Royal Academy).